Visitors to the National Archaeological Museum in Chieti today hoping to see the famous limestone statue of The Warrior of Capestrano (Il Guerriero di Capestrano) were astonished to find that it had been removed from its plinth. The priceless statue was taken from the museum early this morning without the permission of the mayor of Chieti, Francesco Ricci. This statue was first discovered in 1934 by Michele Castagna, a farmer who was digging in his vineyard near Capestrano. It has since become the recognized symbol of the Abruzzo region. The imposing sculpture standing at 2.09m is believed to be the funeral effigy of King Nevio Pompuledio, leader of the Vestini tribe in Abruzzo. It has supports on both sides and is mounted on a plinth. The inscription on one of the supports (written in South-Picene dialect) bears his name. He wears a mask and decorative headgear and is dressed in armor protecting his chest and back: a wide belt encircles his waist; he carries a short sword, knife and axe; he also wears a necklace, armlets and a pair of sandals. He is considered the embodiment of the Italic warrior. Apparently Silvio Berlusconi wanted this precious masterpiece at the G8 headquarters near l’Aquila as a room decoration to impress Barack Obama and the other world leaders. The G8 is due to take place next week in a police barracks in Coppito near L’Aquila from 8-10 July. The mayor of Chieti announced just yesterday that the warrior wouldn't be moved from the museum, because of the risks of transportation as well as the risk of aftershocks in l'Aquila; but this morning the statue was taken away at 8.30am. The act of moving an extremely fragile, 2,600 year old statue from a museum just to use as a room adornment seems reckless to me. Why couldn’t they have used a replica? Two perfect copies already exist (made from plaster) one in the Museum of Roman Civilization in Rome and another one in Capestrano castle! Although the original statue appears in good condition, the legs and feet of the warrior are already fragile and in fact metal inserts have been used to repair fractures. The 65cm circular warrior's headgear is detachable, so there is a chance that it may break. The risk of damage to this precious statue is great. Tel: +039 0871 331668 – +039 0871 330955. Trasferimento del Guerriero di Capestrano al G8. 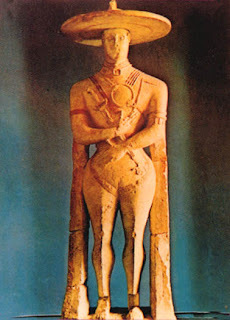 I visitatori al Museo Archeologico a Chieti che oggi, 4 luglio, hanno voluto ammirare la statua celebrativa del Guerriero di Capestrano sono stati sorpresi di scoprire che la scultura era scomparsa. Questa statua, databile del VI secolo AC, fu ritrovata nel 1934 da Michele Castagna, durante i lavori agricoli per l’impianto di una vigna nella località Capestrano. Essa raffigura un guerriero dell’antico popolo italico dei Piceni – il Re Nevio Pompuledio. In costume militare con le braccia ripiegate sul petto, l’altezza della statua senza la base raggiunge 2,09m. La testa è protetta da un elmo che copre le orecchie e da una maschera sul volto. Porta una spada, ed un pugnale appesi davanti al petto, mentre con la destra regge una piccola ascia. Gli ornamenti sono costituiti da una collana rigida con pendaglio e da bracciali sugli avambracci. Il copricapo, caratteristico con le sue larghe tese (65cm) che lo fanno assomigliare ad un sombrero, è stato interpretato come un elmo da parata. La figura poggia su un piedistallo ed è sorretta da due pilastrini laterali, sui quali sono incise delle lance. Su un sostegno vi è un’iscrizione in lingua Sud-Picena con il nome del Re Pompuledio. Oggi costituisce un capolavoro di ineguagliabile valore artistico e storico ed e' il simbolo riconosciuto dell’Abruzzo. Oltretutto, era disponibile due copie perfette dell’originale - uno nel museo della Civiltà Romana a Roma e l'altro a Castello Piccolomini, in grado di suscitare altrettanto interesse e ammirazione! Hello good day to you! I’ve read your blog and find it very much interesting. Can you do me a favor? Can I ask you to post my link in your blogroll/sidebar? In return with that I’ll write an article for you which are related to your blog. In this way, we both can benefit since there would probably more visitors in your blog and mine as well. It would be my pleasure if you will accept my request. Thanks in advance! I am more than happy to post your link in my blogroll/sidebar. I was interested to read about the English Language School in Dublin and the Italian Lanugage school in Viareggio!